Photos by Tom Rivers: Gatlen Ernst, left, and his father Steve work this morning on one of the docks that has been raised more than 2 feet at Ernst’s Lake Breeze Marina. 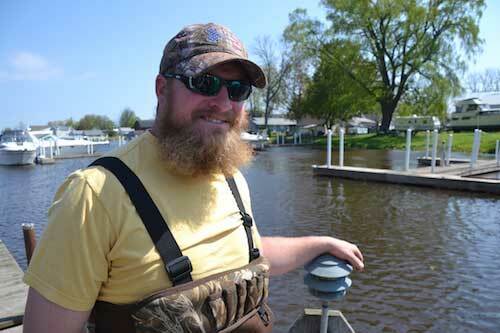 Galen Ernst has raised some of his docks so boats can get back into the Oak Orchard River, which he said has risen about 2 1/2 feet since early April. POINT BREEZE – There’s normally a lot of energy this time of year at the marinas and docks along the Oak Orchard River. Many boaters have their vessels in the water. Charter boat captains usually are busy taking anglers out fishing and pleasure boaters welcome the refuge at the lake. But high Lake Ontario water levels have many of the docks under water. That has kept many of the boats on land. 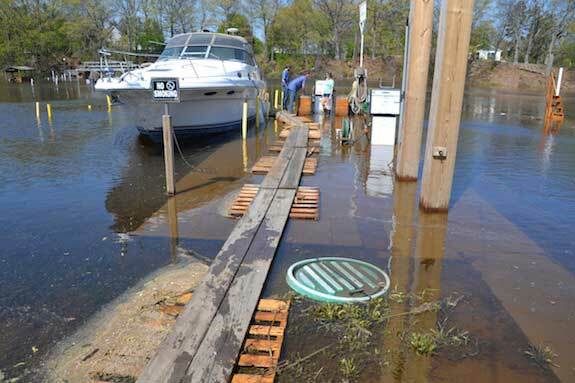 One marina owner, rather than wait perhaps weeks – or longer – for the water to go down and make the docks accessible, decided to raise his docks. It hasn’t been easy. Gatlen Ernst and his staff have been in the water in waders, tearing apart the docks and making them higher. “It’s finding the right method,” he said. Ernst and his crew, including his father Steve, have experimented, swapping out stringers and lifting the docks up about 26 to 27 inches. Many of the boating slips remain underwater at the marina. He has about 90 boat slips at Ernst’s Lake Breeze Marina. 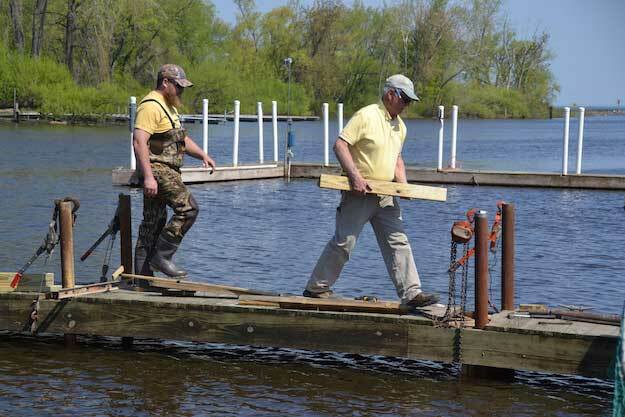 After raising two docks, he now has 22 spots open for boats, and is working to have more docks available. Ernst’s is about a half mile from the lake. Since the marina opened in early April, the water has gone up about 2 ½ feet, Ernst said. Even with little rain the past week, the water still inches higher each day, often with trees and other debris floating down the channel and out into the lake. Ernst continues to keep the marina functional, launching boats and pumping gas. Lois Caldwell, an Ernst employee, checks the gas pump today with employees from Reisdorf Oil & Propane. 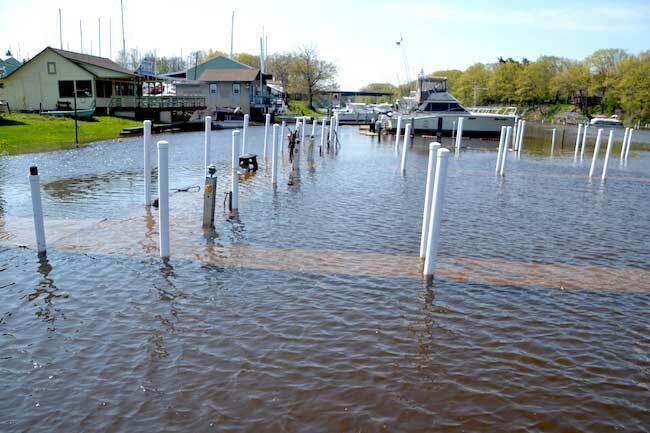 The marina remains operational despite the high water. Ernst has placed planks on pallets so people can walk on this dock. The lake businesses and their customers have a short season when the weather is good. Ernst pushed to get the docks raised, so the boaters and Point Breeze area could get into the water and boost the Point Breeze economy. “The high water is hurting business for everyone, for sure,” he said. Ernst has a lot more work to do to get all of the docks raised. He estimated it takes about 2 ½ days to raise a dock, which have about 15 to 20 slips. 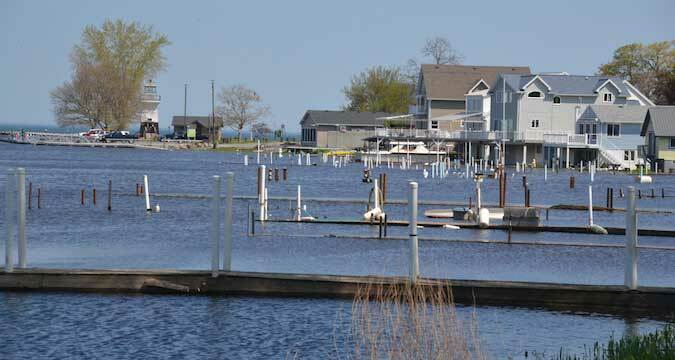 The marina wants to have spots for boaters with competitive fishing tournaments scheduled for next month, the Condor on June 9, and the Orleans County Open on June 10-11. Many of the docks remain under water along the Oak Orchard River.